My husband is not a baked potato fan. He's made that very clear. Several times..... He is, however, a huge fan of twice baked potatoes. So I've found the perfect compromise since I do appreciate a good baked potato. 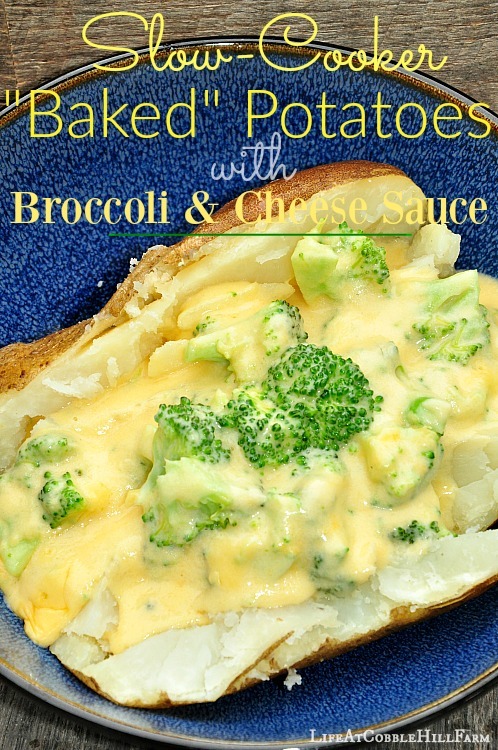 I scoop out his potato and mix it with a little butter, milk, and cheese (as I would for a twice baked potato), but I don't bake it a second time. Instead, I spoon it back into the shell and throw it under the broiler for a minute or two. This makes him a very happy guy. I am a big believer in using small appliances to make your life easier and the slow-cooker is one of those that I tend to lean heavily on. 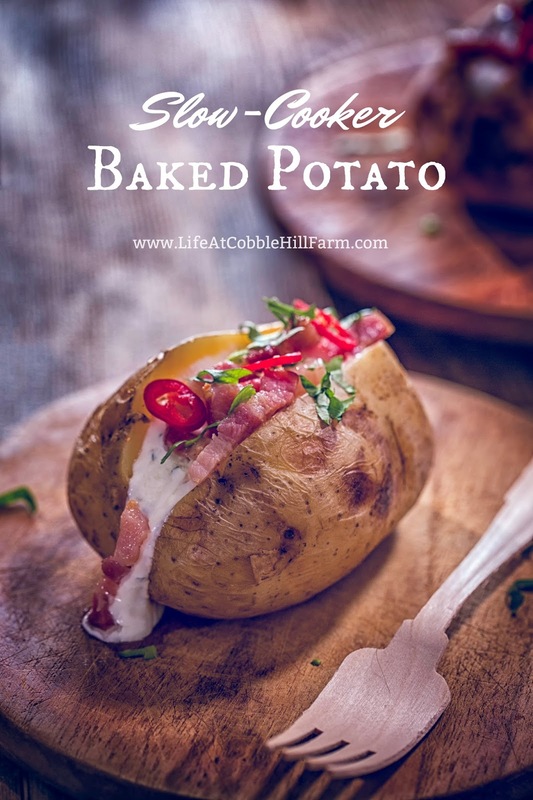 I was shocked the first time I'd heard someone used a slow-cooker for "baking" potatoes. I'm not sure why I was so surprised, I guess I'd just never thought of using it for this purpose before. I now almost always bake them in the slow-cooker (in the summer I use the grill instead - those instructions are below as well). Lay out 4 sheets of aluminum foil, each large enough to wrap around 1 potato. Prep the clean potatoes by pricking several times with the tines of a fork or a small paring knife. Using your hands, rub olive oil on the skins. Sprinkle the potato skins with a little bit of salt. 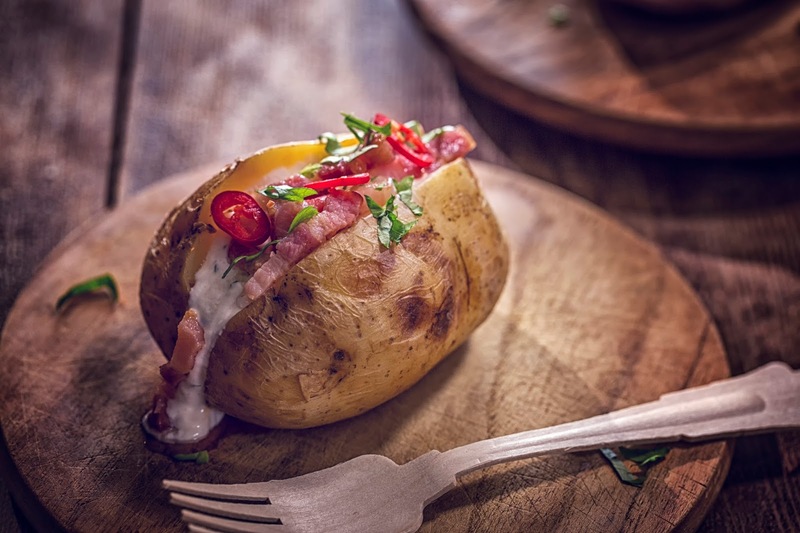 Set each potato in the center of a piece of foil and tightly wrap the foil around it, making sure none of the potato is exposed. Grill Instructions: Preheat the grill for indirect grilling. 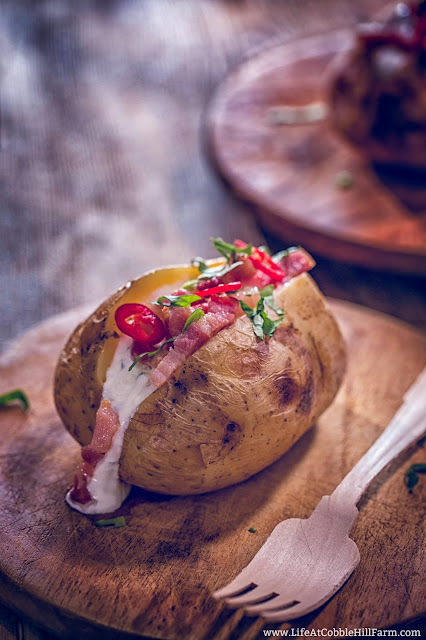 Place the prepared potatoes off of direct heat, on the grill grates, for 1 - 1 1/2 hours, keeping the grill temperature around 300 - 325 degrees Fahrenheit. Once potatoes are cooked, carefully unwrap and slice open. Place on a serving plate and using a fork, mash the inside slightly and add toppings as desired. Serve.